The supplementary motor area syndrome is a characteristic neurosurgical syndrome that can occur after surgery in the superior frontal gyrus. The superior frontal gyrus (SFG) makes up about one third of the frontal lobe of the human brain. It is bounded laterally by the superior frontal sulcus. The superior frontal gyrus, like the inferior frontal gyrus and the middle frontal gyrus, is more of a region than a true gyrus. The superior frontal gyrus (SFG) is thought to contribute to higher cognitive functions and particularly to working memory (WM), although the nature of its involvement remains a matter of debate. To resolve this issue, methodological tools such as lesion studies are needed to complement the functional imaging approach. du Boisgueheneuc et al have conducted the first lesion study to investigate the role of the SFG in WM and address the following questions: do lesions of the SFG impair WM and, if so, what is the nature of the WM impairment? 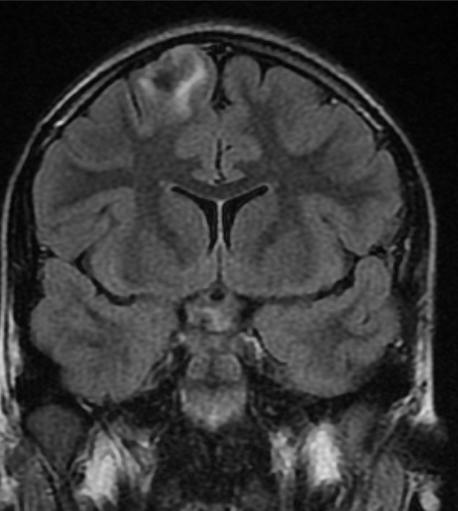 To answer these questions, they compared the performance of eight patients with a left prefrontal lesion restricted to the SFG with that of a group of 11 healthy control subjects and two groups of patients with focal brain lesions prefrontal lesions sparing the SFG (n = 5) and right parietal lesions (n = 4)] in a series of WM tasks. The WM tasks (derived from the classical n-back paradigm) allowed us to study the impact of the SFG lesions on domain (verbal, spatial, face) and complexity (1-, 2- and 3-back) processing within WM. As expected, patients with a left SFG lesion exhibited a WM deficit when compared with all control groups, and the impairment increased with the complexity of the tasks. This complexity effect was significantly more marked for the spatial domain. Voxel-to-voxel mapping of each subject's performance showed that the lateral and posterior portion of the SFG (mostly Brodmann area 8, rostral to the frontal eye field) was the subregion that contributed the most to the WM impairment. These data led us to conclude that (i) the lateral and posterior portion of the left SFG is a key component of the neural network of WM; (ii) the participation of this region in WM is triggered by the highest level of executive processing; (iii) the left SFG is also involved in spatially oriented processing. The findings support a hybrid model of the anatomical and functional organization of the lateral SFG for WM, according to which this region is involved in higher levels of WM processing (monitoring and manipulation) but remains oriented towards spatial cognition, although the domain specificity is not exclusive and is overridden by an increase in executive demand, regardless of the domain being processed. From a clinical perspective, this study provides new information on the impact of left SFG lesions on cognition that will be of use to neurologists and neurosurgeons 1). du Boisgueheneuc F, Levy R, Volle E, Seassau M, Duffau H, Kinkingnehun S, Samson Y, Zhang S, Dubois B. Functions of the left superior frontal gyrus in humans: a lesion study. Brain. 2006 Dec;129(Pt 12):3315-28. Epub 2006 Sep 19. PubMed PMID: 16984899.